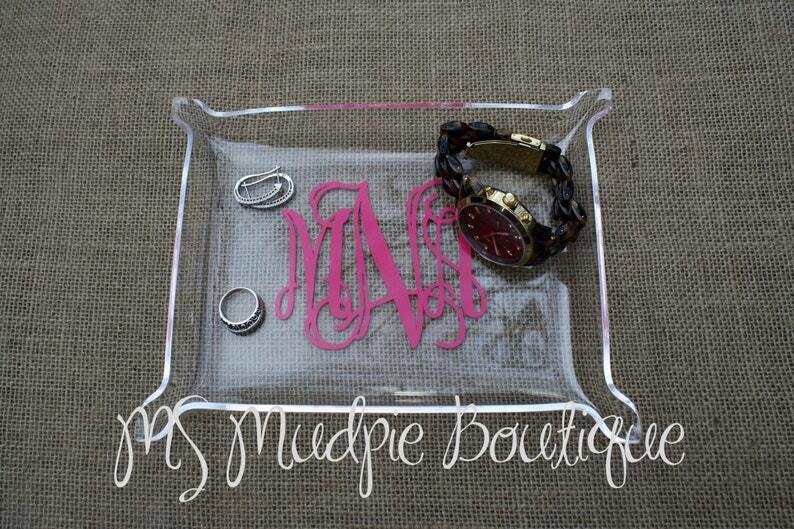 These monogrammed jewelry dishes are super popular and a must have! They are perfect to keep beside your sink, on your nightstand, bathroom counter, or any other place you can think of. The monograms for these dishes are made from high quality, commercial grade vinyl. Dimensions for tray are 8 x 6. They made from high quality Lucite Acrylic, and they are very sturdy and durable! They are flat on the bottom with a beautiful fluted design to the corners. Looks great and arrived fast. Dark purple color is perfect. Loved these!! They arrived in time for the party and were a big hit with the graduates!